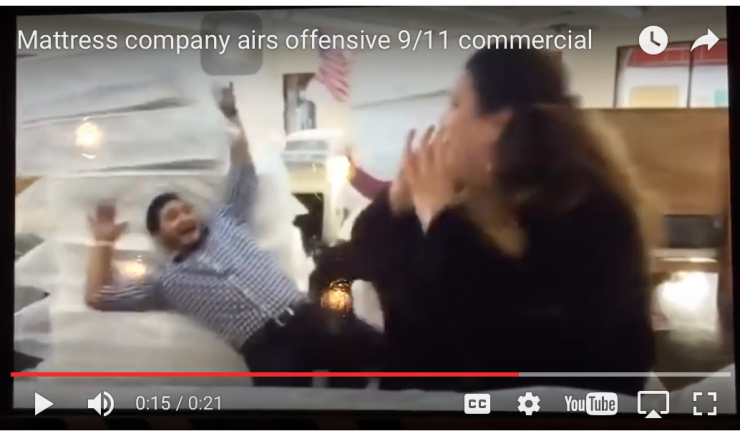 September 10th, 2016 – As the 15th anniversary of the tragic events of 9/11 gets closer, one mattress company is getting grilled after airing a commercial promoting its “Twin Tower” sale. Miracle Mattress, a San Antonia based company, filmed a 21 second commercial enticing consumers to buy any mattress at the price of a twin size in an attempt to capitalize on the anniversary of the terror attack. “What better way to remember 9/11 than with a Twin Tower sale? Right now you can get any size mattress for a twin price,” the woman exclaimed before two other employees crashed into a pile of mattresses stacked to look like the Twin Towers. The commercial was taken down, but marketing expert Jamie Barrientos quickly uploaded it to YouTube. It didn’t take people long to start slamming the commercial for being tasteless and insensitive while some people joined in on the humor and even decided it was a smart marketing tool. On Thursday Mike Bonanno, owner of Miracle Mattress, released a statement condemning the commercial and claiming it was uploaded without his knowledge or approval. Just one day later, Bonanno issued another statement saying the store will be closed indefinitely. Controversy surrounding 9/11 jokes is nothing new and has received more traction lately when David Spade made a 9/11 jab aimed at Pete Davidson (who lost his father in the attacks as a child) during the Comedy Central Roast of Rob Lowe. 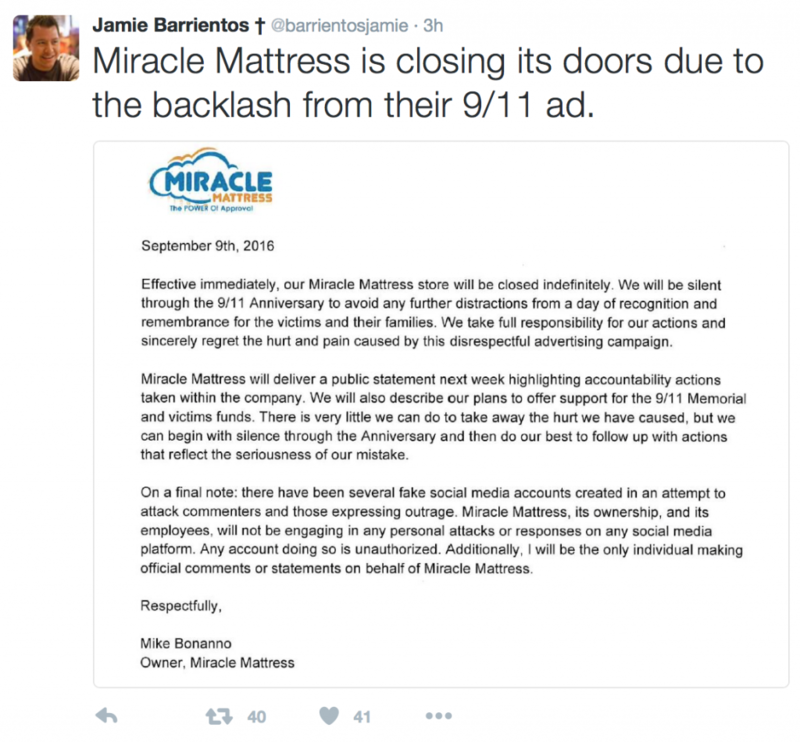 Additionally, Miracle Mattress isn’t the only company to run into backlash after playing off 9/11 with their brand. A Walmart in Panama City Beach, Florida received lots of criticism from their Twin Tower display of Coca-Cola products. Is 9/11 still an off-limits event? Funny or Offensive? Vote and comment below. Was the “anime-inspired” Snapchat filter FUNNY or OFFENSIVE?